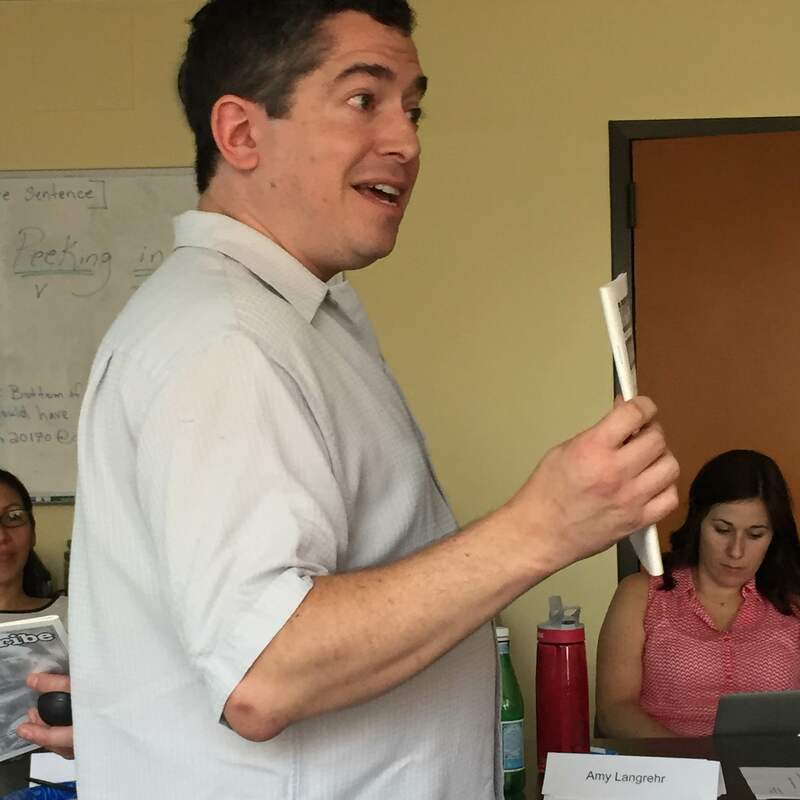 I spent the last few weeks co-writing a couple of articles on writing instruction and critical pedagogy. The process was as exhausting as it was exhilarating. I somehow managed to sucker two infinitely more talented educators into letting me write with them, and I didn’t want to disappoint. By the end of the process, I felt hollowed out. The cognitive demands required to engage in serious reading and writing after a day of teaching took me by surprise. I’m a teacher and a writer. So why was this so hard for me? For sure, writing is complicated, and I’ve spoken about my ADHD before. But my struggle to complete two articles suggested to me that something else was going on, something deeper than just feeling tired or having a hard time focusing. On a lark, I went through the four recent issues of Voices from the Middle, NCTE’s middle grades journal, and performed a quick tally of the authors. I placed each author into one of three categories: P-12 teachers, academics (professors, think tank/policy people, and education scholars who were not currently working at a P-12 school), or both. Out of the 37 articles I checked, 25 (68%) were written by academics, eight (22%) were collaborations between P-12 teachers and academics, and only four (11%) were written solely by P-12 teachers. My sample size was small, and my methodology simplistic, but it’s hard to imagine that a more thorough analysis would yield dissimilar results. So what’s up with the under-representation of primary and secondary teachers? I’ve come to the conclusion that the structures comprising P-12 public education actively discourage scholarship. For the sake of this post, I define scholarship as any sort of self-directed intellectual activity existing outside the immediate sphere of P-12 schooling. Publishing, speaking at academic conferences, engaging in intellectual discussions on social media, and maintaining meaningful professional correspondences are all examples. Additionally, for the remainder of this post, I’ll be using “middle school teacher” as a stand in for P-12 teachers. The first set of structures working against middle school scholarship are those governing the average teacher’s time. Every day I have two planning periods. One of these planning periods is always eaten up by mandatory meetings with my grade level team or my content level team. The other planning period is by necessity a dumping ground for everything else: administrative work, meetings with students or parents, email, responding to student work, trips to the restroom, and if I’m lucky, actual lesson planning. The day to day structures governing my behavior leave little time for off the books intellectual activity. Everything I do during my planning periods revolves around the quantitative, rational, and standardized nature of teaching. Discussions about assessments deal with the how, rarely the what or the why. Lesson planning is firmly yoked to standards, assessment data, and measurable skills. While these activities are of course important, they are primarily technical in nature and insular in focus. There is no time for building intellectual networks with colleagues when every moment of collaboration is funneled through corporate models of efficiency and outcomes. The next structures problematizing teacher scholarship are a school’s expectations. I have never worked at a school where teachers were encouraged to engage in intellectual activity beyond the occasional reading group for admin-approved literature. Or where teachers were celebrated for undertaking scholarly pursuits. In my experience, when teachers are celebrated, it’s for having children or getting married, planning student-teacher conferences, completing various rounds of testing, helping out with after school events, etc. I mention these activities not to disparage them, but to use them as evidence of what is expected and what is celebrated. In my experience, professional development typically deals with the technical aspects of teaching, as well. In the last few years, I’ve attended trainings on thinking protocols, rubrics, and using technology to support struggling students. I’ve enjoyed many of these sessions, but they’re showcases for technique. Outcomes are already determined, tools are already assigned; all that’s left is to show up and absorb. Growing up, I don’t remember any of my teachers discussing intellectual pursuits or recent publications. Did I see them as good teachers? Yes. Masters of their craft who could make me work harder than I thought possible? Of course. But not intellectuals. Everything my teachers said or did fit into the insular and artificial world of schooling, assignments, metrics, and rankings. Years later when I became a pre-service teacher, I spent most of my time reading articles on various instructional strategies and then pontificating on how I might use each strategy in my imaginary class. There was no talk of reading or writing outside the transactional nature of the assignment. The situations I’ve outlined are not new. Historically, morality, patriotism, and self-sufficiency have always been more important to American public education than intellectualism or scholarship. Policy elites, philanthrocapitalists, and politicians have been dictating what’s best for teachers and students since at least the late nineteenth-century. Combined, these structures play an essential role in determining who teachers are, what they do, and what is expected of them. Scholarship and critical discourse have never been part of a teacher’s subject position. We are continuously being spoken for. We function within a set of structures discouraging organic, intellectual pursuit. It’s not that teachers are unintellectual. It’s that our intellectual resources are trained forever inward, focused on the narrow and technical aspects of our craft. These are important issues, but they represent only a sliver of what it means to be an educator. There can be no discussion when outcomes are planned in advance. Productive and informed discourse cannot exist when there is no time to think, read, write, and learn. Although the structures discussed throughout this post aren’t going away, they can be loosened and expanded. As teachers, let us begin this process by telling our stories and continuing to connecting through social media. Pick one or two academics to follow and communicate with. Link up with other educators and seek out conferences and journals to participate in and write for. Form your own reading groups. Figure out what absolutely must be done and what you have some wiggle room with. Over time, our individual actions will accrete. The structures won’t crack, but they’ll expand. Pete joined the NVWP in 1998. He helped start the Journal of the Northern Virginia Writing Project. It went strong for around thirteen years until Congress stopped funding. He is going to talk about publication specifically related to fiction. He will also talk to us about traditional publishing (vs. self-publishing, which is strong now). Quickwrite1: Take ten minutes, and as thoroughly as possible, answer these two prompts. You can combine them or keep them separated. 1. Describe your experiences (successful or not) with publication. If you’ve never tried to publish before, why not? 2. What are your publication goals? Do you feel as though you are making progress towards accomplishing them? Why or why not? My first encounter with publishing occurred after I took a course on Hip-Hop during college. A few weeks after the class ended, the professor contacted me and asked whether or not I would be interested in publishing my final term paper in a new journal he was starting: The Journal of Hip-Hop. As a side note, I can’t seem to find much mention of the TJoH on the internet, suggesting the journal closed up shop. So I made sure my paper (a sophomoric attempt called ‘Hip-hop, ghetto-centricity, and the commodity fetish) looked good and sent it off to him. A few weeks later he invited me to the launch party in D.C., a swanky affair with a few rappers like Common in attendance. Although I remember feeling bummed out that I never received any galley proofs, it was my first taste of sharing my writing with a larger audience. A few years later I “published” my MA thesis (with an equally torturous title: ‘Becoming TRL: A Deleuzian-Guattarian Approach to MTV’s Total Request Live’). I’m not sure that really counts, but I remember my parents telling me to list it as a publication on my resume at the time. Since then I’ve pretty much ignored the realm of publishing. What a scary thought! As soon as I picture my writing appearing somewhere other than the saliva-flecked screen of my laptop I freak. Who am I to put my thoughts out there? What on earth could I possibly add to the various conversations taking place in the public sphere? When will I have the time? Ack! Gotta stop writing! BTW, I just randomly googled that cruddy hip-hop paper I wrote and found out that someone cited it in their own work! Crazy. 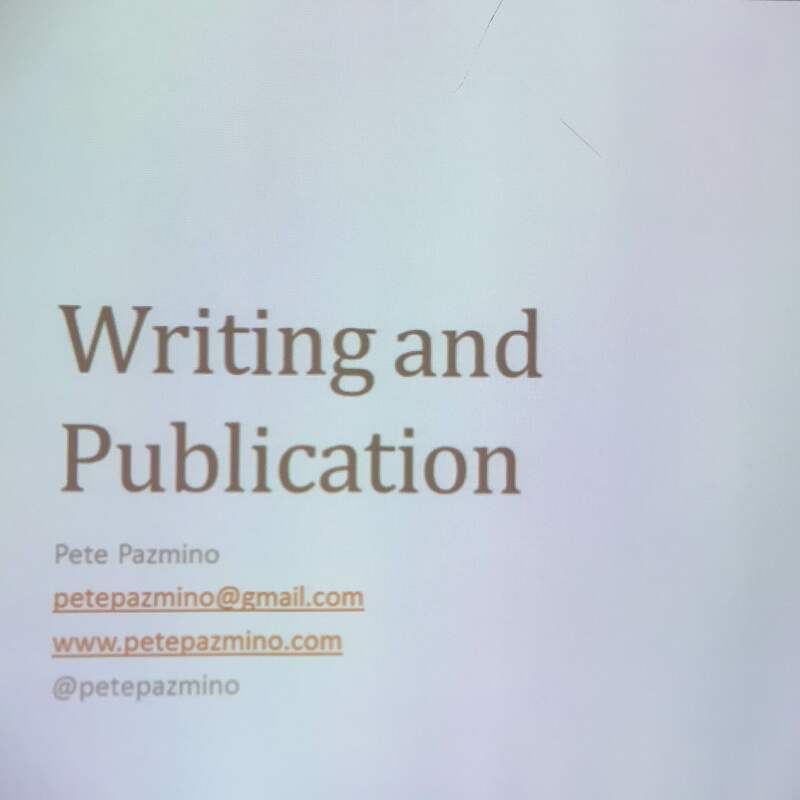 Pete tells us he only writes if it’s something he wants to get published. He doesn’t journal. He’ll jot down an idea, but he won’t spend time journaling unless it’s for a story for possible publication. He tells us about his publication history. He shows us his very first publication from 2003, a crime story published in some long since defunct journal called Detective Mystery Stories. Networks are essential, Pete says. Writers need to form networks with other authors, local journals, small presses, etc. So he knows where to turn to get feedback or find out where to send a particular draft. This dude is impressive. Pete, btw, doesn’t like the previously posted Betty Flowers demarcation of the writing process (see previous post). He says he wears every writer hat at the same time. Here is his process. 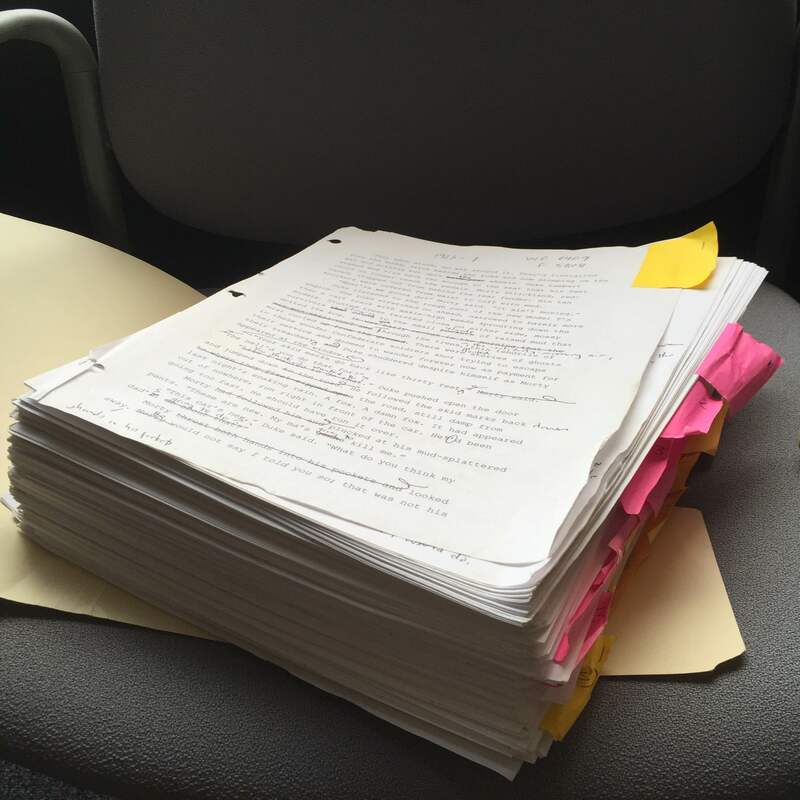 Draft to publication is a six month process. 1. Draft, Revise, Edit: write, revise, edit until as perfect as possible. This takes time. 3. Work on more than one piece at a time. This helps out with boredom by letting you cross-pollinate your work. -Show, don’t tell: this is about ensuring your story is active, is drawing the reader in. Remember that backstory isn’t present action (and that’s a bad thing). -Kill your darlings (Faulkner! ): The darling is a line or character or scene that you think is so good. -Everything has to be on the table: Be willing to change anything and everything you’ve written. -You will get rejected a lot. -Read back issues to see what kind of stories they publish. -Don’t post what you want to publish on your blog. –www.duotrope.com : Start here! A great place to search for publishers of writing. You can search by genre, style, payment, etc. $5 a month. Although the site is for fiction and poetry, if you search enough on it you’ll find journals that also accept non-fiction. –www.pw.org : Poets and Writers. -CRWROPPS (Creative Writing Opportunities List; Yahoo group) : A yahoo group. Send an invite and you’ll get it. Daily email lists of places to submit your pieces. The list connects you to journals. Don’t use your primary email for this because you’ll get between ten-twenty emails a day. -Calls for Submissions (Facebook group) : Another private group requiring invitation. Good place for beginners to go. -For publication offer, accept immediately and notify other markets that story is no longer acceptable.